There is little in the early life of the Swiss economics graduate Aemilius Müller (1901-1989) which could provide evidence of any comprehensive interest in colours. After studying economics, he went on to become, in turn, an advertising manager, a graphic designer, and a journalist. In 1941, however, he chanced upon a remainder of Wilhelm Ostwald‘s Farbfibel (Colour Primer), and thus stumbled upon a new aim in life: the creation and publication of a method for dealing with colours, based on Ostwald’s ideas. 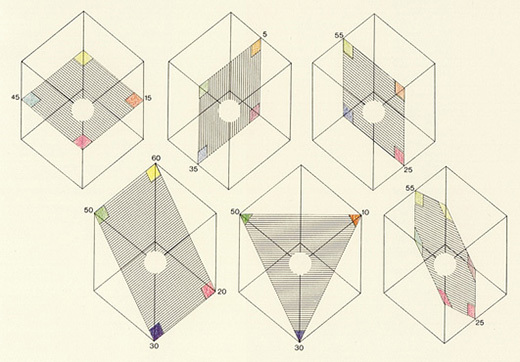 By 1944, he had already published his Swiss Colour Sample Card, and in 1948 the first edition of his Modern Theory of Colour Harmony appeared, with colour in architecture as its theme. Müller pointed out that the gradations of colour-hue, often appearing monotonous, can be made more attractive by allowing them systematic deviations; at the same time, however, so-called colour inversions were to be avoided. What, then, does this newly coined term actually mean? Both in the spectrum and in the colour-circle, each colour has a specific luminance, with yellow being the brightest and blue the darkest. According to Müller, colour combinations can only appear harmonious if the relationship between their brightness corresponds to the natural relationship between the associated colours. In the reverse situation (and here we have the inversion) there will be discord. 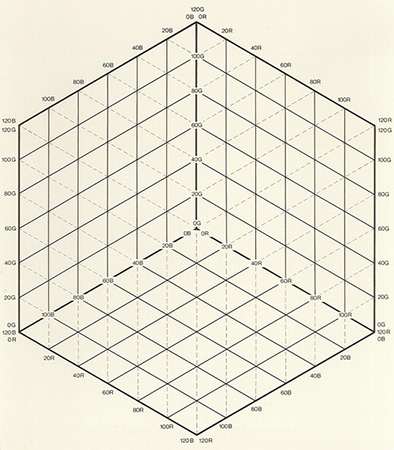 The «Three Colour Cube 1.000» shown here was introduced by Müller in 1951, the original version of which comprised 10 plates of 100 colours, with each plate demonstrating the systematic mixture of colours significant to the printing industry. 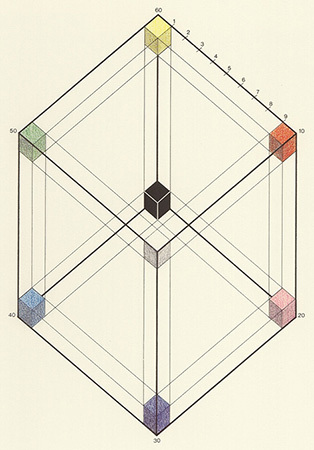 Müller’s cube is based on proposals from Max Becke and — like all colour cubes — graphically shows the mixtures which are possible using three basic colours. For subtractive colour mixing, the eight corners are occupied with three primary colours: yellow (60), magenta (20) and cyan blue (40); three secondary colours: red (10), blue violet (30) and green (50); and the achromatic colours: white and black. The further illustrations reproduce some stabilising links within the cube and at the same time accentuate its geometry. The «Three-Colour Cube 1.000» is itself based on the basic colours normally encountered in three-colour printing — yellow, blueish red (magenta or purple) and greenish blue (cyan blue). It represents a system of mixing colour, in that it shows the colours that arise when three transparent layers of the subtractive basic colours are superimposed at varying levels of saturation. The way in which Aemilius Müller adopted and transformed Ostwald’s ideas is shown in his second system. Date: The «Three-Colour Cube 1000» by colour theorist and practician Aemilius Müller was intriduced in 1951. Bibliography: Ae. Müller, «Die moderne Farbharmonielehre», Wintherthur 1948; W. Spillmann, «Ein Leben für die Farbe: Das Werk von Dr. Aemilius Müller», Winterthur, Applica 24, p. 717 (1984).